This is just going to be a really quick post as I am sure all of you have read everyones favourites around this time! Firstly is this amazing book written by Shane Dawson! It Gets Worse! I am not really a fan of all these youtube books coming out. I have nothing against them but don't personally choose to read then all. One person that I will always and forever love is Shane Dawson! I got his first book, it was so real and amazing I just had to pick up his second book! I highly suggest reading this book. Even if you have never seen a youtube video in your live this would still be an amazing book to read. One really random thing I have been loving this month is lip liner! No lip liner in particular just actually lining my lips has been very fun to experiment with and I will continue to do it! I also hope to grow my lip liner collection! The two liners featured in the picture are IT Cosmetics and Models Prefer. If you guys read my post on Charlotte's Lab you will know that this had to be in my favourites! This is the Jojoba and Kaolin Face mask! If you want to know more about it read the review I did in my other post! This lovely Essie shade in not just a pretty face has been a favourite this month as its very simple and pretty. I stick to light pink shades as they are easy to pull off yet still add a touch to your outfit! On to my eyebrows!! My routine has changed quite a bit! I am now using a pomade and an eyebrow gel! I use to be way to scared of pomades as I thought they made my eyebrows look to think and fake! However, after using this IT Cosmetics product a few times a realized it doesn't have to be that way! Now I use this product in my brows everyday! A major bonus is there is heaps of product in this little pan and it has not dried out! I have been topping this with the Models Prefer clear eyebrow gel! This just helps to keep everything in place all day long. Lastly is a Herbal Essence product! This is the Naked Shine Shampoo with white tea and mint extracts! Unless you have tried this shampoo before you have no idea how amazing this smells! It is absolutely stunning. This does a great job at cleaning there hair while also adding moisture! These are the things I have been loving this month! I hope you enjoyed reading this post! 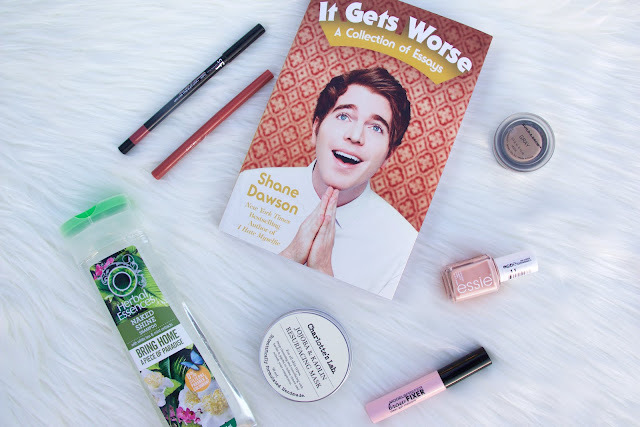 Have you read Shane Dawson's book?